Dental implants have become the most predictable and reliable option to replace missing teeth. By surgically placing a titanium implant post into the jawbone, it replaces the root of the tooth. As a result, it stimulates the jawbone to encourage new growth. This allows it to be the only dental prosthetic that can preserve your bone density due to tooth loss. After your jawbone has fused to the implant post, an abutment is then attached, which is needed to connect a custom-made dental crown. It will be made to meet your exact specifications to blend in seamlessly when you smile. With the right care, the implant post can remain in place forever. Although the dental crown is not subject to tooth decay, that does not mean that you can stop brushing or flossing your teeth. Instead, you should become more committed to it to reduce your risk for implant failure due to infection. When brushing, it is best to choose a soft-bristled toothbrush and nonabrasive toothpaste to avoid causing scratches to the crown. After you have cleaned the crown and all surfaces of your teeth, take the time to floss around the crown and the abutment to remove any plaque or bacteria that may lead to an infection. You may find a water flosser easier to use. In addition to your home oral hygiene, it is also best to see your dentist regularly for a cleaning and checkup. During this time, they will check your oral health and the implant to ensure that no complications have developed. If an issue does arise, quick intervention can help to prevent it from failing. 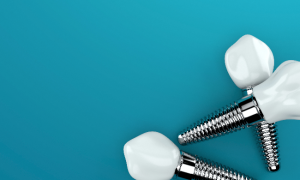 Although your dental implant post will not need to be replaced, the crown will suffer from daily wear and tear. As a result, it will need to be replaced about every 10 years. You can help to promote its longevity by avoiding chewing overly hard foods with it or using your teeth as a tool, such as to open packages. If you are ready to make an investment in your smile, your dentist in Harrisburg can help. See if dental implants are the right solution for you today! Dr. Gary M. Klein provides advanced dental care in the community. In addition to general services, he offers many areas of specialty, including dental implants. If you are suffering from tooth loss, he can help you regain a complete smile. Contact Klein Family Dentistry today to schedule your consultation.